Getting Past "You Know What Your Problem Is?" It's getting really old, like change-the-channel old. Finger-pointing dominates speeches and interviews as the national political rhetoric grows more divisive. Network interviewers report these verbal attacks and replay them over and over. Often the speaker's judgmental remarks for what's "best for America," are based on his--yes, there are some women participating, too--personal impressions and feelings and opinions rather than external facts. That is, subjectivity rather than reality. Never mind the truth of the matter, just replay the attacks. Older people rather than younger seem often most involved. Why, when a person attacks another person or political idea, does the interviewer not ask, "What solution do you suggest? And why do you think your solution is best? What experience or information is the basis? Who benefits most from your suggestion?" How did it get this way? What are these attackers hiding? I understand some people have a tendency to associate and bond with people like themselves. And others have a tendency to collect in diverse groups. Companies whose products require an innovative environment know to staff them with people with the latter tendency. Social change, too, benefits from group diversity. I conclude organizations who oppose change have a tendency to seek people like themselves, whether their groups are political or social. Personal attack ads and discourse are also ignoring the wisdom of loving one another that originated in most religious organizations. Clearly many national and state political speakers, their financial support organizations and their network interviewers are not trying to create a conversation about the issues for American voters. The best way I know to have a meaningful conversation is for speakers on both sides of an issue to talk for themselves, in "I" statements: "I think ...", "I believe...", "I propose..." with no "you's" involved. I learned this participating in the early 90s in Community Building Workshops conceived by M. Scott Peck, that started with total strangers. They worked by letting groups teach themselves they could come together if it was safer for everyone to participate and defend their views without drawing personal attacks for having done so. Group members changed their minds if and when they were ready, after listening to others say how they themselves had become who they are and what they believe. I think, given history, social change is as foregone a conclusion as changes in the natural landscape and technical innovation. 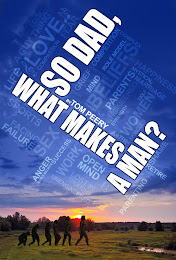 I would like to hear about more places for Americans to come together to voice their opinions safely, such as The Cenacle Retreat House's current workshop for men: "So Dad, What Makes a Man? A Walking Tour of Male Spirituality," in Houston, where I am one of the facilitators.